Originally published in 1995, the Coffee Taster's Flavor Wheel—one of the most iconic resources in the coffee industry—has been the industry standard for over two decades. In 2016, this valuable resource was updated in collaboration with World Coffee Research (WCR). The foundation of this work, the World Coffee Research Sensory Lexicon, is the product of dozens of professional sensory panelists, scientists, coffee buyers, and roasting companies collaborating via WCR and SCAA. This is the largest and most collaborative piece of research on coffee flavor ever completed, inspiring a new set of vocabulary for industry professionals. The Coffee Taster's Flavor Wheel can be purchased in the SCAA Store. Click here to get your poster today! Digital files of the Coffee Taster’s Flavor Wheel are now available in Chinese (Simplified & Traditional), Korean, Portuguese, and Spanish languages at the new and improved SCAA Store! Posters will debut at the SCAA Expo in Atlanta, GA and will be available online after the event. To get your digital version of the Coffee Taster's Flavor Wheel, please click here. The Coffee Taster's Flavor Wheel is licensed for use under the Creative Commons Attribution-NonCommercial-NoDerivatives 4.0 International (CC BY-NC-ND 4.0). The only exception to the non-commercial use term is that the Flavor Wheel may be used within a book, with attribution per the terms of the License, so long as the book isn't primarily about the Flavor Wheel. For more information pertaining to book publishing, please contact Tara Smith at tsmith@scaa.org. For more information about the Creative Commons License pertaining to the Flavor Wheel, please click here. Italian and French versions are currently being developed. All translation development work must be led by the SCAA, and goes through a review process to ensure accurate translations. If you would like to request that a language be considered for a future poster please contact tsmith@scaa.org. Trade restrictions between the U.S. and Iran prohibits SCAA from developing a Farsi language poster at this time for distribution in Iran, and also from authorizing any licensing options for Iranian distribution. Per the Creative Commons license carried by the Flavor Wheel, unauthorized translations of the poster may not be distributed. 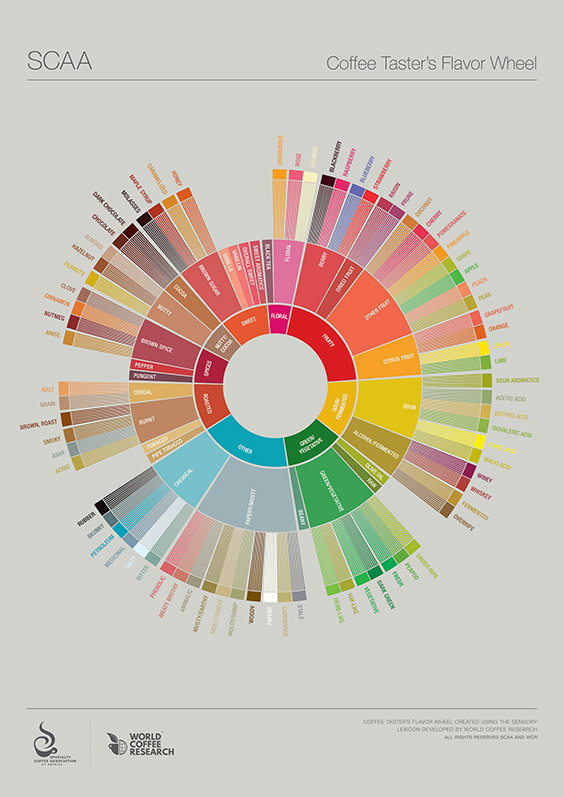 The Coffee Taster's Flavor Wheel by SCAA and WCR (©2016) is licensed under a Creative Commons Attribution-NonCommercial-NoDerivatives 4.0 International License.